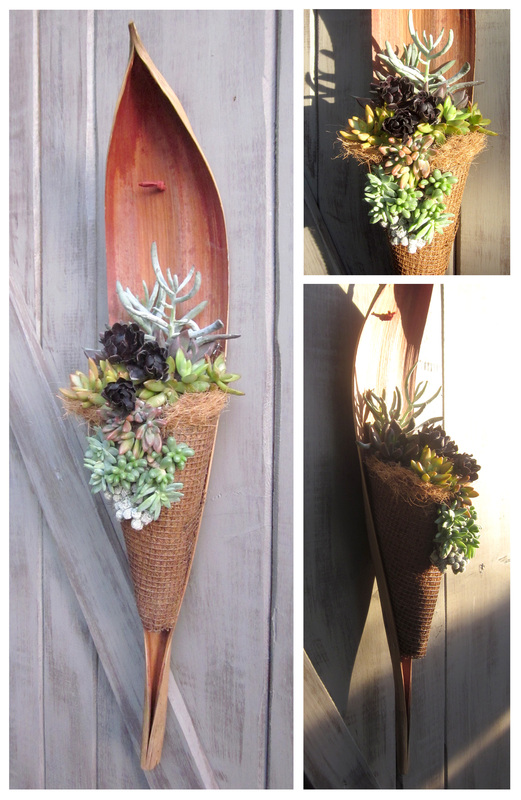 Four major components go into this project: a palm scoop, metal mesh screening (an idea I cribbed from succulent-container maven, Vickie Perez; thanks, VP! 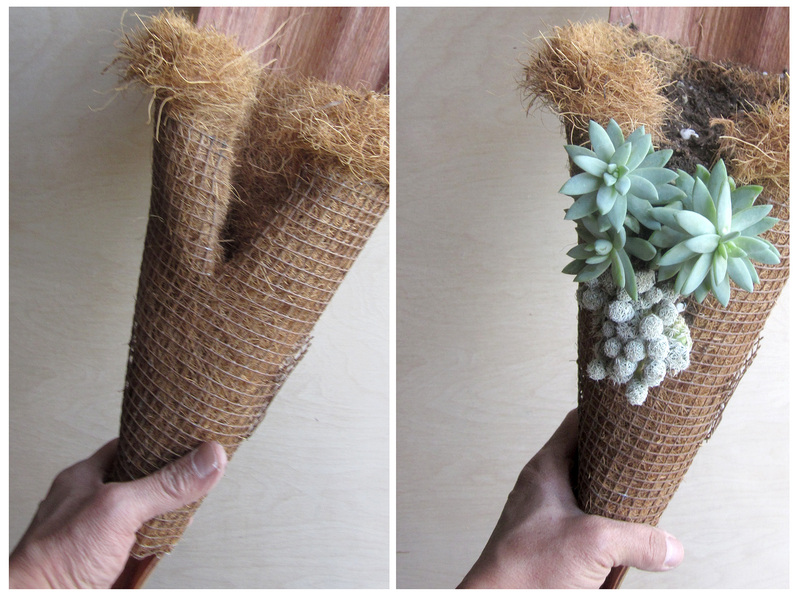 ), coconut fiber hanging plant liner and an array of small, colorful succulents. Everything but the scoop came from a big-box hardware store. Additional items used, that I already had on-hand: wire; wire cutting pliers; hammer; rust-colored, large permanent marker, textured, spray paint; staple gun, cactus mix soil, leather cord. Nothing fancy or pricey. 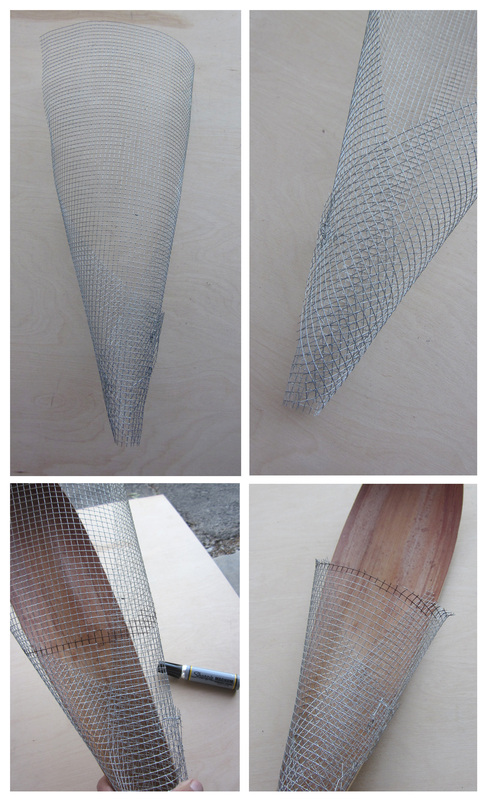 I began by cutting the metal mesh with wire-cutting pliers to an approximate size and rolling it into a cone-like shape (use gloves while doing this step). Holding it up to the scoop, I adjusted the cone’s size to fit snugly against it. Happy with the fit, I anchored where the cone overlapped at the bottom, and used small lengths of wire threaded through and twisted to secure them. Way too long, I held the cone up to the scoop, and used a marker to roughly mark where the plant pocket’s top should end. Using the pliers again, I cut along the line. 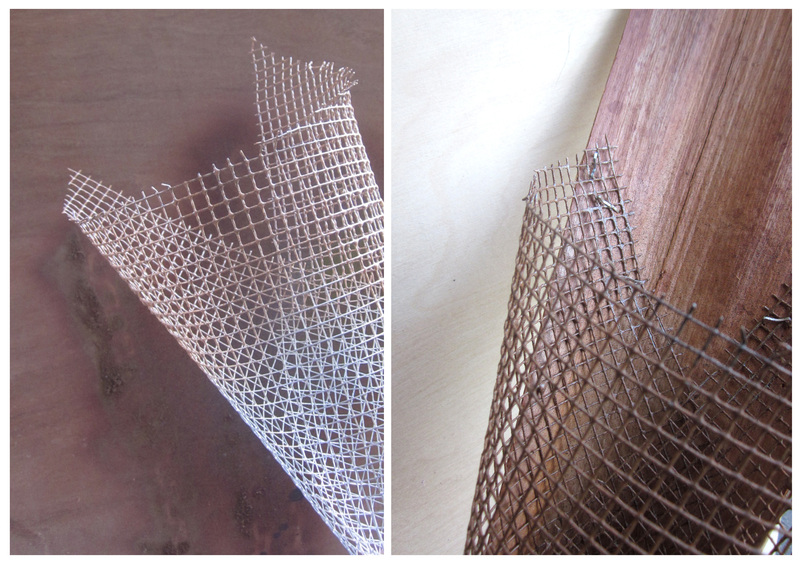 The mesh’s silvery finish was too jarring; spray paint in a rust-tone quickly took care of that. I made sure to cover the pocket inside and out with several coats. This particular spray paint features a rough-textured finish that looked perfect once dried. I placed the cone on the scoop and using a staple gun secured each side with several staples. Some of them didn’t go in fully; I used a small hammer to drive them all the way home. I took the coconut fabric and cut a length that would fit into the mesh cone; I pushed it firmly down its entire length. I trimmed the excess fabric at top, making sure to leave enough to push onto the raw edge of the metal mesh, securing it. I knew I didn’t want the plants to just stick out of the top of the pocket, so, using the pliers again, I cut an opening down the front vertically and rolled it back. 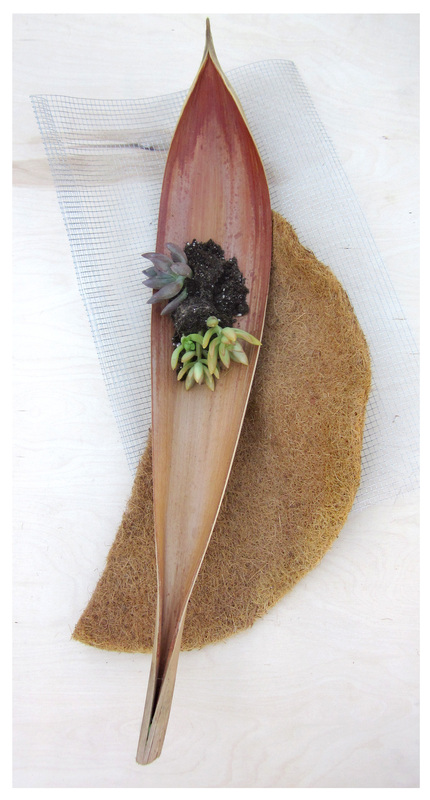 I then filled the bottom of the cone with cactus mix soil and added the first succulent. Firmly planted, I add more soil and then the next plant. Eventually the pocket filled with layers of plants and soil. The succulents I used were chosen for their contrasting shapes and colorful foliage … some black aeonium rosettes from the yard add dark spice to the mix. Once everything was planted, I marked and drilled a hole for a hanger. 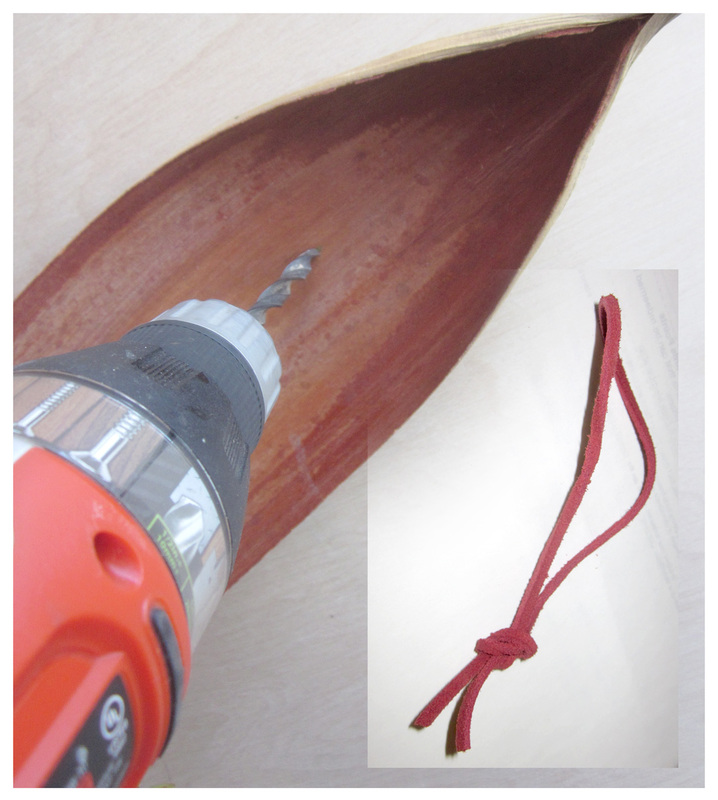 A small length of leather cord pushed through the hole from behind, then knotted, provided the simple and effective solution. The wall pocket-sconce is a picture of loveliness, up-front or in profile. I hope you’ll try this project, or some variation of your own devising … if you do, please email me photographs and I’ll post them here! Thanks, Jenn! … and so easy, too. Thanks, Lenora … I appreciate it! I love this, Reuben. I am so stealing it. I have seen something along this line sometime ago but have forgotten where or when. Glad to help with any ideas!! Have found so many thru you and figure to use them sometime soon. Until then I will continue along my merry way. So do like to come onto your blog. 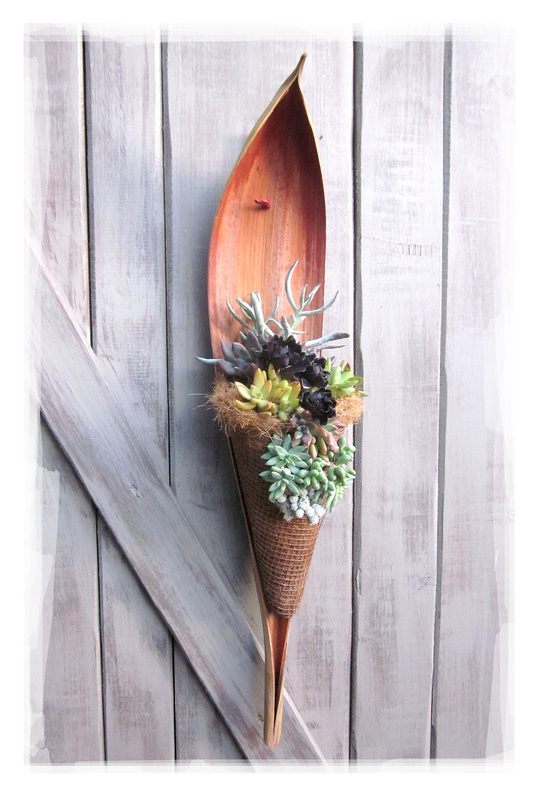 Hey, Miss V, if you remember where you saw the similar planter I’d love to see it … and thanks again for being an inspiration! Gorgeous! I’ve never wished we had messy palm trees in the area before. Thanks for commenting … look around, maybe there’s something else you could use … send pics, if you do! I meant to ask how this came out when I was at your house last… SO beautiful… I new it would be! I was telling Cosme, from Division 9, about this design and how brilliant you are, and I didn’t even see the finished product yet… I only had your vision. Great job Reuben! Thanks, Britney… I meant to show it to you and forgot in my soup frenzy … How’re your latest Rancho-additions looking? Maybe you can take one more when your brother picks up his big pot? I so wish I lived in Palm Tree Territory! Would really like to make this but alas there are no palms readily available in the midwest. I’ll have to find another creative element to substitute, but love the lines of your finished project! Thanks, Rebecca … I think the project can be adapted easily to some other natural element … if you do create your own please send a pic, I’d love to see it!